Already on the decline worldwide, big trees face a dire future according to James Cook University's Distinguished Professor William Laurance. Jan 27, 2012: - Already on the decline worldwide, big trees face a dire future according to James Cook University’s Distinguished Professor William Laurance. Writing in New Scientist magazine, Professor Laurance said that the world’s "biggest and most magnificent" trees face a range of threats. Reviewing research from forests around the world, he said that there was evidence of their decline due to habitat fragmentation, selective harvesting by loggers, exotic invaders, and the effects of climate change. He said their demise will have substantial impacts on biodiversity and forest ecology, while worsening climate change. "To persist, big trees need a safe place to live and long periods of stability," Professor Laurance said. "But time and stability are becoming very rare commodities in our modern world." Giant trees offer critical habitat and forage for wildlife, while transpiring massive amounts of water through their leaves, contributing to local rainfall. Old trees also lock up massive amounts of carbon — in some forests they can account for more than a quarter of living biomass. “But their ability to sequester carbon and render other ecosystem services is threatened by human activities. 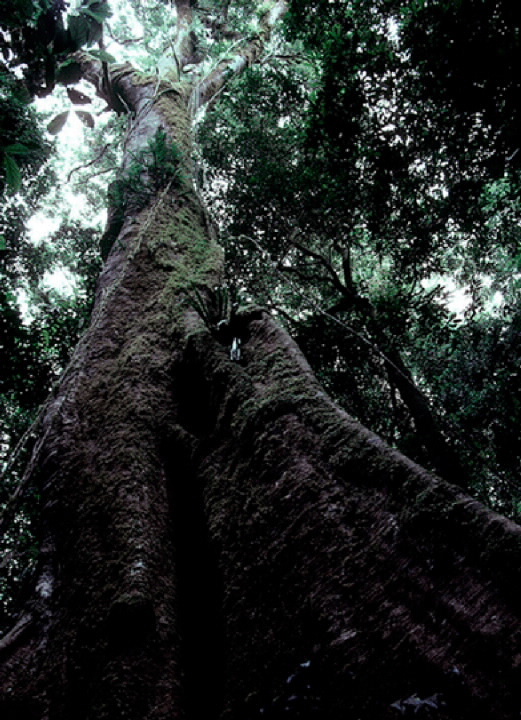 Some of the world's largest trees are particularly targeted by loggers. The oldest trees are among the most valuable and therefore the first to be cut in ‘virgin’ forest areas,” he said. Professor Laurance's own work in the Amazon has shown substantial die-off of canopy giants in small forest fragments. “Their susceptibility seems counter-intuitive given big trees' life histories, which invariably include periods of drought and other stress,” he said. "All around the tropics, big canopy and emergent trees are succumbing to strong droughts. "That's been a surprise to me and many other ecologists, because big, ancient trees would have had to survive many droughts in the past." Professor Laurance said that forest giants may suffer disproportionately from climate change. "According to one popular theory, trees get a double-whammy when the thermometer rises. During the day, their photosynthesis shuts down when it gets too warm, and at night they use more energy because their metabolic rate increases, much as a reptile’s would do when it gets warmer. “With less energy being produced in warmer years and more being consumed just to survive, there is less energy available for growth. “This hypothesis, if correct, means tropical forests could shrink over time. The largest, oldest trees would progressively die off and tend not to be replaced,” Professor Laurance said. Professor Laurance said that climate change was also having less direct impacts on forests, including creating conditions for exotic pathogens to thrive. For example, pathogens such as Dutch Elm Disease, introduced by trade or circumstance, have devastated trees in many parts of the world. “All told, the outlook for big trees is not good,” he said. "The decline of big trees foretells a different world where ancient behemoths are replaced by short-lived pioneers and generalists that can grow anywhere, where forests store less carbon and sustain fewer dependent animals. “It’s a place where giant cathedral-like crowns could become a thing of the past." Reference: Laurance, William F. 2012. How the mighty are fallen. New Scientist, 28 January, pp. 39-41.